Tried a small piece, a feather earring with brick stitch. Need more practice. Not much time to practice for some time. alumphfres, LISA IRONMAKER, subeeds and 2 others like this. Doing the earrings was a good way to distract. Aww those are so pretty good job I like it. Keep up the good work. Your awesome! It will take some time. 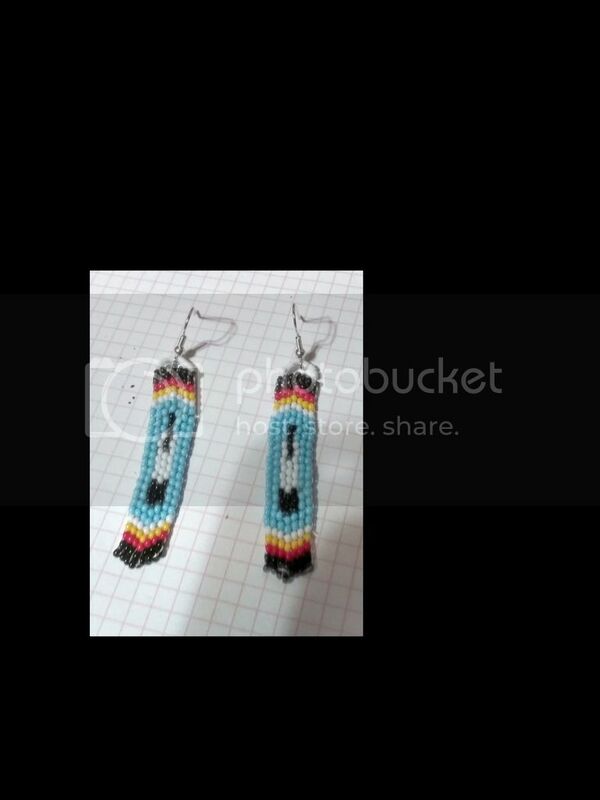 Think I have a pattern for dangle bird earring in colors I like. Made nearly a dozen feather earrings for the July gathering of the colt army collectors and shooters woman. We have tenth anniversary and those earrings are gifts, give aways at that occasion. I like the blue ones, look very pretty! I would have liked to have a pair in royal blue but I couldn't get size ten beads of that color for some time and size 9 or 11 doesn#t fit with the other ones. And the realy baby blue is likewise missing. Think, than I would need a pink pair to. Time for you the start working small :). Bring on those 13/o cuts. Back in the day, I had a pair of earring that were little miniature marked and unmarked handgame bones. The marked ones had a ring of gourd stitch around the centers in 20/o's. If I can find them, I'll post a picture. Last edited by OLChemist; 04-11-2019 at 04:02 PM.. Reason: Yikes, good English speeching here. Oh weh, my eayes hurt. I do beading already with the glasses of. That smuch better than with glasses on. LOL. I nearly have the eyesight of a mole. Handgame, that brings up Roger Welsch and the Omaha. I like his books. Tried gourd stitch and failed misarably. Has to wait. Got a nice drawing in black and white of a Colt Army 1860. The size is I should do it isn't clear. I beleive it should be done in applique though with very samll beads 16/0 or so, lazy stich or crow stitch may be possible.